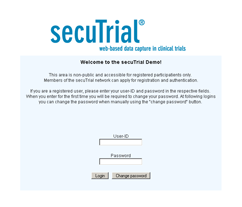 Use our interactive presentation to gain an initial impression and overview of the most important functions of secuTrial®. To start the presentation, simply click on the picture. The presentation will open in a new window and lasts around 9 minutes. To end the presentation, simply close the window. A current version of Adobe Flash Player and a sound card are required to watch the presentation.